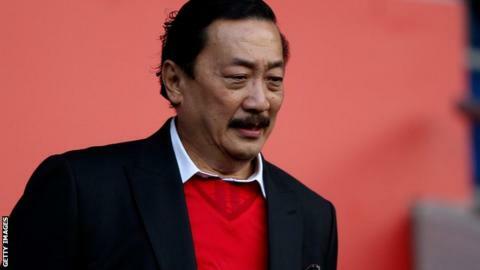 Cardiff City owner Vincent Tan has entered the world of British horse racing after buying a two-year-old colt for £190,000. The Malaysian businessman made the purchase at the Doncaster Bloodstock Breeze-Up Sales on Thursday. It is thought Tan bought two racehorses in Australia earlier this year, but this is his first purchase in Europe. The new acquisition, which is expected to race for the first time this summer on the flat, has yet to be named. Tan's colt will be trained in Wiltshire by Australian Jeremy Gask. The horse is a son of Australian mare Mary Goodnight and Dutch Art, who won the Norfolk Stakes at Royal Ascot in 2006 and was runner-up in the July Cup a year later. "We are very excited, and pleased to have Mr Tan involved," Eamonn Wilmott, Gask's business partner told BBC Sport. "The horse looks exceptional and dominated the parade rings outside the sales." Tan is fond of the number eight, which is a respected figure in Malaysia, and the colt was foaled on 8 March, 2012. It is not known at this stage what his racing colours will be. Tan caused controversy at Premier League side Cardiff when changing the club's traditional blue shirts to red in June 2012. He was not at the sales, with the purchase made by one of his representatives.